Learning about personal finance is good, but it is not enough. To realize results clients have to put knowledge in action. This concept is called financial capability. Justine PETERSEN helps people obtain financial products and services that produce real world results: higher credit scores, access to affordable credit and bank accounts. Justine PETERSEN (JP) knows people’s lives improve when they are not only financially literate, but financially capable. Many not-for-profit organizations are interested in providing credit building products to their clients but are constrained due to regulatory barriers, lack of lending or processing experience, and staffing resources. 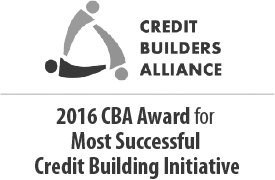 Justine PETERSEN launched Credit Building Nation – our partnership model with other nonprofit organizations to expand credit building across the country – to address the lack of access to credit building products in other geographic markets. Through this model, JP certifies other organizations’ financial coaches/counselors on JP’s proven “Credit as an Asset” credit building method. Once trained, the partner organizations incorporate JP’s method into their financial counseling. As counselors identify clients who could benefit by pairing financial product to financial counseling, JP provides loan origination, loan servicing, and credit bureau reporting. Opened 1,500 IDA accounts and facilitated 1,000 matched withdrawals for asset purchases.